SpellChecker (or SSuite Office SpellChecker) is a portable and completely free spell checker for Windows. Unlike other similar software or applications, it doesn’t underline misspelled words with Red line. It processes all words one by one, added on its interface, and automatically stops on a particular incorrect word. After this, it provides suggestions to replace the misspelled word with the correct word. It comes with multiple dictionaries in different languages to detect wrong words and provide suggestions. However, only a single dictionary at a time can be used to check spelling mistakes. You can also customize a dictionary to add or edit words. Moreover, you can also export a dictionary in *.odic (Open Dictionary Files) format. In the above screen recording, you can see that it selects every word and provides suggestions for incorrect words. Note: It’s a good software to check spelling mistakes. However, it can’t be used to check grammar mistakes. I would suggest you to try some other software, like LanguageTool and Ginger, to check grammar mistakes. It comes with multiple dictionaries with different languages: English, German, French, Dutch, Spanish, Portuguese, and more. 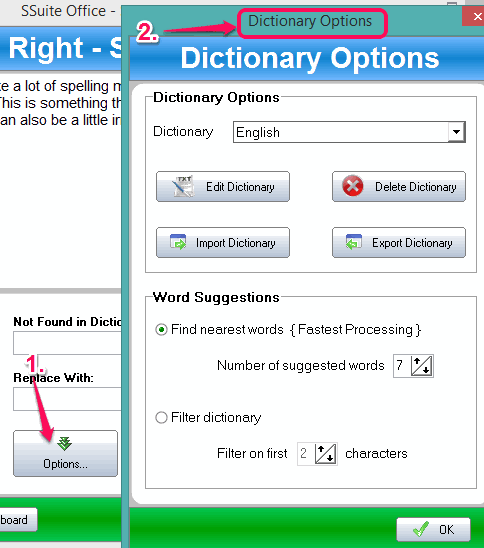 Use Options button to open Dictionary Options window and switch to a particular dictionary. Dictionary Options window is also used to edit the current dictionary and export it as *.odic format. Option to import a *.txt or *.odic format dictionary to check spellings is also available. You can also set number of suggested words to view on Suggestions box. 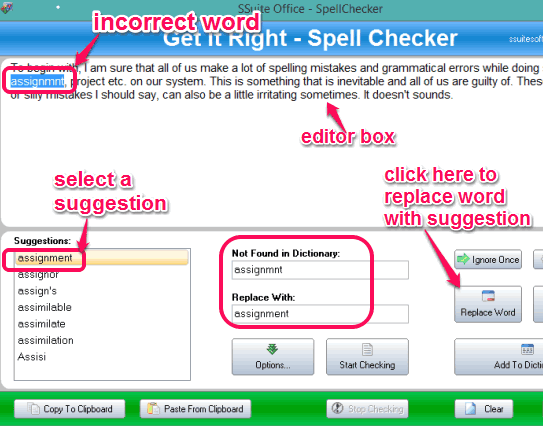 How To Use this Free Spell Checker Software? Jump to the end of this review to access the homepage of this software. After this, download its zip archive. Extract the downloaded zip archive and execute its application file to open its interface. On its interface, you need to type or paste the text (on the editor box) that you want to check for spelling mistakes. After adding the text, tap on Start Checking button. It will immediately start scanning every single word. When a misspelled word is detected by the software, it will select and stop the scanning on that particular word. After this, you will find the Suggestions based on the dictionary selected by you. To replace the text with a particular suggestion, simply select that suggestion and click on Replace Word button. It will replace that word on its editor box and start scanning rest of the text. When all the scanning is completed, it will stop the checking automatically. Once you have checked spelling mistakes, you can copy the whole text in a single-click, and paste it in the required place. It is a pretty simple stand-alone spell checker. It is definitely not the best out there, but if you are looking for something simple and lightweight, with an option to add your own words to dictionary, then this definitely fits the bill.